Meta-analysis of gene expression has enabled numerous insights into biological systems, but current methods have several limitations. We developed a method to perform a meta-analysis using the elastic net, a powerful and versatile approach for classification and regression. To demonstrate the utility of our method, we conducted a meta-analysis of lung cancer gene expression based on publicly available data. 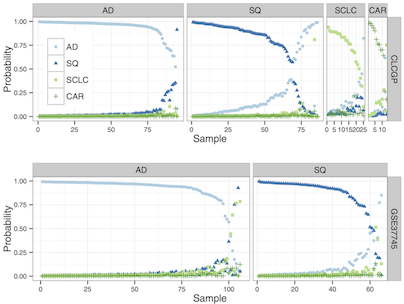 Using 629 samples from five data sets, we trained a multinomial classifier to distinguish between four lung cancer subtypes. Our meta-analysis-derived classifier included 58 genes and achieved 91% accuracy on leave-one-study-out cross-validation and on three independent data sets. Our method makes meta-analysis of gene expression more systematic and expands the range of questions that a meta-analysis can be used to address. As the amount of publicly available gene expression data continues to grow, our method will be an effective tool to help distill these data into knowledge.